I struggled for a while installing this so I thought I’d share the process, in case this helps anyone. So Radiant is the great content management system for Ruby on Rails. One basic aspect of any web site is a contact form, a web form that mails, or just sending a form via mail. 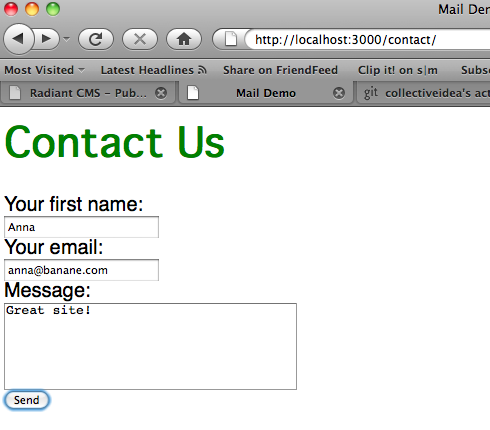 This is “Radiant extension mailer.” It requires “Action Mailer” Plugin from Ruby on Rails. So 3 big steps: install the plugin, the extension, then create the pages. I configured a few very vanilla Radiant installations on Snow Leopard/sqlite3/radiant 8.1 (ruby 1.8.1, rails 2.3.2 ) to test out this mailer. I’m still checking out the extension, but this is how I got it to work. Success was to get an email from the site, in my inbox, with desired form contents. BTW, this uses Gmail’s smtp/TLS service- sending mail via your gmail account using their servers. 1) First, get the Action Mailer & TLS plugin, by entering this from your Radiant root. 2.a) Put this code in the “config.after initialize do” block of your environment.rb file. Note: the domain is the localhost upon which this application runs. Put in your gmail login and password. To test, refresh server. Should refresh with no errors. You don’t have to run update or migrate (run Rake -T to verify) because the data is all in hashes and not stored in a database. – Contact page. 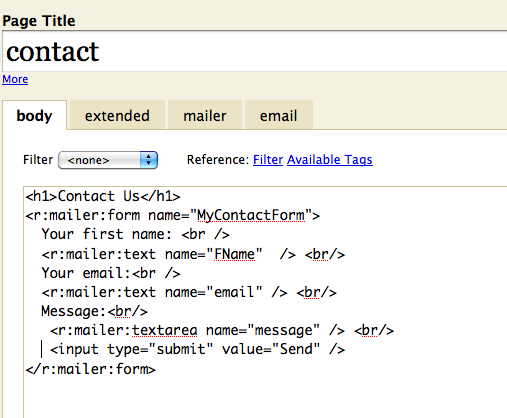 This will contain the form, using <:mailer ...> tags. – Page part of contact called “mailer”. This contains the mail settings in YML. – Page part of contact called “email”. This contains the email content, dynamically rendered. – A new page, as a results page, for this example it’s called “thanks” This is a regular Radiant page. I’m going to devote some space to each page, as they were where most of the errors lay. I kept it simple, with minimal options. Note: the submit is not a :mailer model. 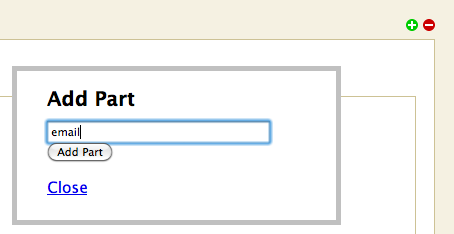 For full options for the form, check the readme/github site. 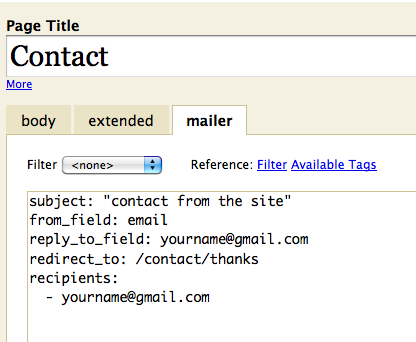 On the Contact page, add a page part called “email” and include your message. This page, on the other hand, very picky. These are the configurations that go to Ruby on Rails’ Action Mailer process. 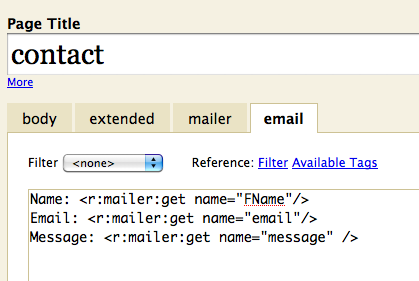 Again, in Contact create a page part called “mailer” (lowercase). This page part is in YML format, so it is very sensitive in regards to spaces and line endings. This is a very simple, bare-bones example but it works. This will send to myself, from the person who submitted the form. Note: the redirect-to is *case sensitive*. So make sure the contact and thanks pages are lower case. You will see an error for that issue, if it occurs, in your server log. OK, with that setup, you can restart your server (just for good luck?) and you’re good to go. Send yourself a message or two. Make sure all of your Radiant pages are published. Check that there are only 2 spaces before the recipients’ dash, in the mailer page part. Check that your “redirect_to” is in the same case as the actual pages. The form simply “reloads” with no visible progress? If it reloads quickly, it’s probably not actually emailing – as it takes time to hit and verify the Gmail server. Check your server log. If it doesn’t know where to put the result, the redirect path basically, that will be a 302 in your server log. If the form refreshes with the values still in the field, and no “localhost” (or your domain) in the footer, and no mail file in the log, then the configuration of your “mailer” page part is probably wrong- or it could be an issue with your environment.rb edits. If your connection to Gmail works, you will see this kind of printout in your log. If you don’t see this long acknowledgment, then it’s not really sending mail. I’d recommend double-checking your username/password, or reinstalling the action_mailer plugin (just re-git it to that directory, or check the directory to see that it’s installed right). Plugins and extensions have picky naming conventions- the action mailer plugin has to be the name of the file,as well as the “mailer” extension. *the best* post ever is Shaolo’s quick writeup on how he did it. When I read this post a literal light bulb went off in my head: New question: Gmail and action mailer — Thanks Shaolo if you read this. Written Tuesday, October 27th, 2009 in technology, Uncategorized. You can leave a response, or trackback from your own site. Hi Banane, I was thinking about using the mail sending back then. How would you rate it? i think there are more good tips which is help people! It didn't work for me until I add :enable_starttls_auto => true into the smtp_settings hash. Ok – I solved my problem – for reference – I was using the heroku sendgrid addon and it adds emails to bounce lists – and I was playing with the contact form with lots of garbage email addresses, so it ultimately added my valid email ad to the bounce list. after clearing it it worked again!